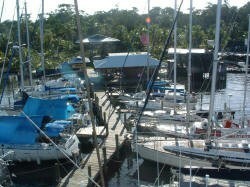 Panama Island Marina with Waterfront Home For Sale in Bocas del Toro. Located in a well established hurricane free cruising ground and a developing Caribbean destination. Property includes a full service 37 slip marina, 2 story custom home, dockside office and cruisers kitchen & lounge, small boat storage racks, covered workshop, rental storage building, separate water storage tanks.